The Jesus and Mary chain will release a new studio album in March 2017, it has been confirmed. Alan Mcgee, the co-founder of the band's former label Creation Records teased "kinda enormous" new music coming soon from the Scottish band in an interview with CBC Music. "They've made another album! It's a big deal! It's unbelievable," McGee explained. "They've just made an album and I've singed them to Warners!" An announcement came from the Creation Records official Twitter account, stating: "JAMC will drop their new record March 2017...on Warners of course!" 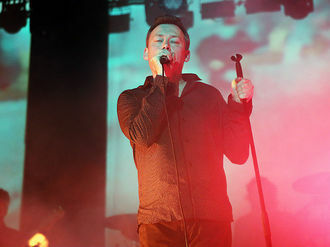 Jim Reid told Time Out New York in October last year that that it was "early days" in the recording process for the record, and that the material had "a more mature sound for the Mary Chain". The release will mark the first new material from the band in over 18 years, following 1998's Munki, released before the band's split the same year. The Jesus and Mary Chain released a live album last year, Live At Barrowlands, which captured the band's performance at the iconic Glasgow Barrowland Ballroom back in 2014. The show was part of the 30th Anniversary celebrations for iconic debut album Psychocandy. The band previously reunited in 2007, though disputes between the Reid brothers hindered recording of the new material. It has been confirmed that The Jesus and Mary Chain will release the record in March 2017 on Warner Bros. Records. Justin Bieber broke down in tears as he performed in Frankfurt, Germany, on Wednesday night (16Nov16). Soul superstar Adele was given a big shock onstage in Mexico on Monday (14Nov16) after a bat crashed her concert. R&B icon Mary J. Blige had to move on from her fractured marriage when her husband Kendu Isaacs allegedly stopped respecting her. Justin Timberlake left Mandy Moore emotionally scarred after poking fun at her feet. Bob Dylan will not travel to Sweden to accept his historic Nobel Prize win. Frank Ocean may never release another album. Ricky Martin is heading to Las Vegas for a residency. Prince's record label has sued Roc Nation for illegally streaming the late music legend's songs. Rihanna is to release all eight of her studio albums in a vinyl box set.